Google has rolled out all new YouTube design and has introduced more user friendly YouTube UI Redesign, its a part of Google+ project in which Google is changing UI of all its products. The new YouTube design is quite neat and clean as compare to its previous design which contains and focused more on two major colors Blue and White but in its new design YouTube now contains three major colors Grey, Red and Black, which has become signature mark of all new Google. YouTube has also improved its UI structure of website in which they made changes in Video pages, the homepage and user Channels and also pulling some style features from Google’s other web products. 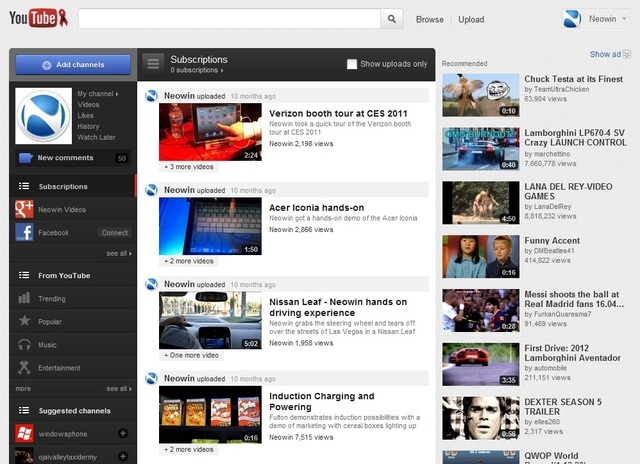 The new YouTube homepage has seen a revamp with social integration and a brand new design. When you will get logged in you will notice all the new videos from your subscriptions in a list, with customization features on the left. You can filter the videos based on the selectors on the left, along with customizing your own channel, connecting with Facebook and Google+ to share videos and viewing suggested channels or popular YouTube videos. I think the new and improved YouTube design is quite impressive and user friendly to manage all video subscription from homepage login. What guys have to say about new YouTube Design? Please comments.